The 1984 eruption of Mauna Loa. This was a sizeable eruption, but far from one of the largest. 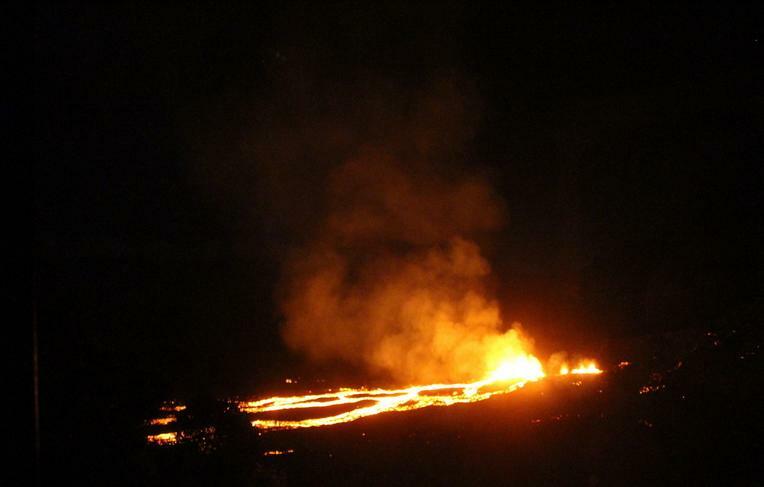 Photo courtesy of Hawaii Volcano Observatory. The world of volcanism is not about being equal. There are small volcanoes, there are big volcanoes and then there is Mauna Loa. And until someone actually proves that the Tamu Massif is one single volcano and not a Large Igneous Province or a multiple volcano area I will continue to refer to Mauna Loa as the world’s largest single volcano. The numbers are just staggering. It is built out of 75 000 to 80 000 cubic kilometers of lava, it is 17 kilometers high (roughly) and it is so heavy that it has pushed down the underlying crust a whopping 8 kilometers. And obviously that translates into both large and numerous eruptions. Mauna Loa is between 600 000 to 1 000 000 years old and that gives us between 0.12 and 0.075 cubic kilometers of erupted lava each year. Obviously it does not erupt every year, so some eruptions are pretty darn impressive. And before anyone starts to say that all eruptions are large, some of them last for just a day and are rather piddly. Mauna Loa is so large that it creates its own gravitational field. Due to the volcano being so massive that it is bending the crust it is also forming its own tectonic scheme with a major NE/SW trending rift zone that transects the shallow top caldera. The SW part is 100 kilometers long and that can erupt at all parts of its length (but no eruption has been witnessed that opened the entire rift). The NE part is shorter and has historically only erupted from its top 20 kilometers. Many people say that Mauna Loa is cyclical and that it shifts between mainly having rift eruptions and mainly having top vent eruptions and that we are currently in a rift eruption part of the cycle. I find this a fair bit of a conjecture that remains to be proven. Of the historically known eruptions 38 percent have been top vent eruptions, 31 percent from the northeast rift, 25 percent from the southwestern rift and 6 percent from vents on the northwest side. There seem to be something to the theory right? This is the same 1984 eruption out of Mauna Loa. It is just taken from a different angle. Now the real size of Mauna Loa is easier to understand. Photo courtesy of Hawaii Volcano Observatory. Well, not really. The rift zone is really deep, pretty much as deep as the volcano is high and the eruptions there are feed from dyke injections from a deep seated source. The top vent eruptions are fed from a magma reservoir at roughly 4.6km depth. So, in effect we are looking at 3 different eruption feeding systems that probably are joined at the bottom, and as such we should see those percentages at any given time. Another thing we need to think about before we ponder the current activity is that Mauna Loa is big. Hm, yes I just said so, but we have to ponder another effect it has. The entire rift is spreading at an average of 10 centimeters annually and basically all of that motion is in one direction. And that direction is against Kilauea. Now the size of Mauna Loa should start to sink in, after all it is shoving poor Kilauea a full decimeter to the side every single year. And this has an effect and creates a cycle of its own. Normally high activity in Mauna Loa means low activity in Kilauea and vice versa, but then comes cycles where they act like they are two mating tubes of toothpaste squeezing toothpaste out of each other. The 1984 eruption was a co-eruption with Kilauea and the signs that we see now are reminiscent of those seen prior to that eruption. I have also read lately that Mauna Loa leaves few signs before erupting, that is not true. Both the 1975 and the 1984 eruption was accurately predicted years in advance of the Hawaiian Volcanic Observatory. And there is no reason to not believe that they will be able to predict the next one as accurately, but that the warnings will be issued closer to the eruption this time around. Few volcanoes lends itself so well to be predicted using a classic approach as Mauna Loa, probably due to many of the techniques being developed there due to the hard work of the scientists at HVO. At Mauna Loa you follow the seismic record to see what the earthquakes can tell us and you watch how the mountain deforms as magma moves in the system. You also need to know how the mountain is deforming due to its weight and size and the spread of the rift zone. If you do not know the last part and take that into account, you will see things that are not volcanic and interpret it as volcanic. You also need to remember that all that “natural” deforming that is going on produces its own set of tectonic and intra-mountain earthquake schemes. As always, most things at a volcano are not volcanic in nature per see and it is important to know what the effects will be due to those things. Now, imagine that you are a big nice warm blob of magma. You have spent millions of years travelling up the mantle upwelling that forms the stationary hotspot that created the Hawai’ian-Emperor Chain. Your speed of travel is about the speed of a growing nail. As you softly and slowly hit the underside of Mauna Loa you exert an ever increasing amount of pressure, just as a pillow hitting the underside of a mattress in slow motion. As the pressure becomes too large you start to be squeezed into the magma conduit leading up from the Mohorovic discontinuity (mantle/crust boundary). As you slowly travel upwards you will start to pressure the sides of the conduit apart causing short duration tectonic earthquakes that are easy to recognize on a seismometer since the initial break is so sharp. Here at Mauna Loa there are two ways you can go, either you are crushing the side of the conduit at depth and go upwards as a dyke intrusion into the rift zone or you continue upwards into a magma reservoir. Harmonic tremor at Mauna Loa. Image captured by Tyler Mannison. Either way, as you arrive at the depth where there are aquifers you will start to pressure water out of the way causing a fluid signature to appear on the seismometers as you cause earthquakes. 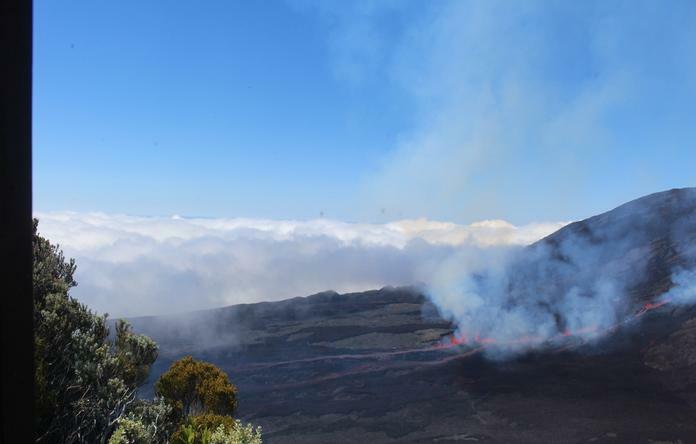 It varies from volcano to volcano when and if this will happen, but if memory serves this start to happen at around 4 to 5 kilometers depth at Mauna Loa. At around 2 kilometer the water will instead start to flash into superheated dry steam rapidly breaking the rock in small explosions. This shows up as pearl chains of small earthquakes that some people call “popcorn” earthquakes. This is when you might be starting to cause phreatic detonations above you. Imagine, you are causing destruction two kilometers above you? Isn’t that pretty neat! Mauna Loa most often does not suffer from this stage. If this is a water rich volcano or you are a volatile rich blob of magma you may cause phreatomagmatic explosions as you mix with water and other volatiles and you may have a pre-eruptive stage that contains mixed fresh lava and water. This is not really a phreatic detonation, nor a true eruption, this is called a phreatomagmatic explosion and can be seen as pre-eruptive fluids. This is the main type of eruption if the volcano is covered by a glacier, and Mauna Loa has not had one of these types of events since the last ice age. Now you are close to the surface at a depth where water will separate as dry steam and other gasses will nucleate and the magma starts to swell rapidly. Now nothing can stop you and you pick up speed rapidly as you joyously travel towards the opening of your choice. This is the stage when we see more and more harmonic tremor indicating rapid movement of magma. On your way up you have moved the bedrock and that will show itself as deformation and inflation of the mountain. When you are still at the lower parts of the volcano the deformation will be diffuse and widespread, but as you travel upwards it will be more indicative of where you are traveling and different parts of the volcano will start to inflate at different rates. And at the end the inflation will be ever more rapid and place specific, so much so that during the last few seconds prior to an eruption the inflation will be counted in meters to tens of meters per second. Think of a bubble getting ready to burst. At Mauna Loa the magma is hot and relatively low in volatiles, so it will normally not be explosive. But there are enough of volatiles to cause the lava to form curtain shaped fire fountains that can be pretty impressive. One last thing to remember about your travels as a magma blob, as you move you will leave a trail of earthquakes that can be plotted. And if someone plots your road of travel it will form a distinct earthquake track. Following tracks like this is like getting a trail of postcards from various stops on the way and it is the best way to follow an eruption before it happens. The combination of over the time more distinct deformation and inflation put together with the earthquake track gives volcanologists a way to both predict when and where an eruption is most likely to occur. And the closer to the surface the happy magma blob traveler get, the easier your arrival at the terminus will be to predict. Now that you have a feeling for how you would behave as a happy warm magma blob we are ready to start looking at the activity that has happened in the last few years. Few people have missed that Kilauea is currently erupting. This has seemingly increased the pace of the previous deformation (and inflation) happening at Mauna Loa. In the last few months magma has slowly moved upwards until the earthquakes has started to transform into bursts of harmonic tremor. The deformation has also started to be more distinct. This deformation may even have affected Kilauea in return pushing the level of the lava lake up. If so we really have two tubes of toothpaste being very intimate indeed. Now a bit of a warning here, it is not uncommon that a proto-eruption putters out at this stage, or that it will take quite some time before the magma reaches the point of no return (think several years). If on the other hand the pressure from below and the joint squeezefest between Kilauea and Mauna Loa continues there will be lava gushing forth in a rare tandem eruption in the not so distant future. Now over to a composite analysis of the earthquakes that have taken place, as we can see there are two spots on the image below that looks promising. One is the likely spot for an eruption judging from both deformation and earthquake data, and the other is a false positive caused by regular deformation and strain caused by the magma deforming the magma reservoir. Can you spot which one is the probable location? The answer Is that it is the smudge of earthquakes on the southwestern part that is the current cause for worry in my opinion, the other swarm is most likely compression earthquakes caused by the expanding magma reservoir under the caldera. So, if we sum it up. We have deformation that over time has become more distinct, a formative stack of earthquakes that is likely to be caused by moving magma, we have a gradual shift in earthquake types, and now we have intermittent harmonic tremor (that has been going for a while). If we take all of these things into account we see that it is likely that an eruption will occur and that it is most likely to occur at southwestern rift zone, or it could occur at the caldera (due to evidence of an expanding magma reservoir). Activity could though stop or delay, and the question is also at exactly what depth has the magma risen to, is it close enough soon to the surface to be buoyant enough to be unstoppable? Because, when that happens things will happen quickly. My personal opinion is that it could happen quite soon, especially if we take into account that Kilauea is being squeezed so hard now that the famous lava lake is rising. Perhaps time soon to plan for a dual lava watching holiday. A couple of points here… that cluster of quakes on the SE flank of Mauna Loa is relatively shallow – 3-6km IIRC. But if you go south from there about 20km – towards Pahala – there’s a more diffuse and intriguing cluster of very deep quakes – 30-40km. I would tend to speculate that at that depth they’re likely to be ‘settling’ quakes connected with the effects of the great mass of the edifice as you pointed out. The earthquakes I was talking about are caused by deformation caused as the shallow magma reservoir inflates. The earthquake swarm you are talking about is most likely caused by the “bending” of the litosphere, just as you say. Problem is that the cycle described falls short on the only true evidence that we have. And that is the current cycle. At least in my view a true cycle is more clearly depicted in known data. Do we know if there have been times in the past where there have been simultaneous lava lakes in both Kilauea and Mauna Loa? Not that I could find in any records. But, it may have happened prior to written records. Great explanation, Carl. Very easy for the uneducated such as I to understand. Thank you. That rifting rate of 10 cm per year is interesting. That suggests 1 meter every 10 years, 10 meters every 100 years, 100 meters every 1,000 years and 1 km every 10,000 years. No doubt the rift fills with consolidated rock as it spreads and the Loihi seamount adds bulk to the south as it grows; but if that rift spans the entire southern third of the Big Island from west to east, would the spreading raise the possibility of a massive landslide at some point in future? It is not quite rifting although I can see why Carl calls it that. It is the rate at which the south side of Mauna Loa slides down towards the ocean. Kilauea is in the way and perhaps prevents collapse. Traditionally, the major land slides don’t go this direction: they affect the east or west side of the Hawaiian islands. The slow slip-slide seems quite a stable process. Kilauea prevents collapse of S-SE side of Mauna Loa…but what is there to prevent a collapse of Kilauea at some point? This has happened in the past. The south flank of Kilauea is slowly slipping to the south. Probably will happen again eventually. Future growth of Loihi will inevitably affect this. It is a bit of semantics here. I chose the word rifting, but it is not a rift like in Iceland. It is not entirely clear if it is a spread due to the magma intrusion that is hindered in one direction, or if it is a slide to the side of about 1/3rd of the island. I find the last a bit problematic since there is so much are to move. But, as Albert points out, it is debatable what term would be best here. There have been at least 8 significant landslides on the Big Island since it grew to its current size, as well as at least 10 others along the Hawaiian chain. From the maps I’ve seen, most large landslides appear to break parallel to volcanic rifts. Not releated to volcanoes, but there was just a big earthquake (big to be in Norway) earlier today that hit 120 km outside of Bergen. It had a power of 3.72 on the richter scale. Some peoples did feel it and they did hear a deep rumbling sound. There is an interesting signal on the Icelandic drumplots at 8:58, lasting around 5 minutes. It seems to be strongest at KIS station, but it can be seen on most drums around Vatnajökull. It looks a bit like the signature of running water, or a teleseism, but it is a bit to widespread to be water and I don’t find any quakes matching a teleseism (plus, it seems to be centered around Bárdarbunga). I saw a similar signal a while back, a week or two maybe, also centered around Bárdarbunga. I’m wondering that if there is no sharp beginning to the waveform that there isn’t a way to accurately locate the position and depth. Just looking at the relative intensities and waveforms on different stations I have the vague impression it *might* have been in the Hamarinn or Gjalp area and pretty deep. It looks like HT but there are several possible sources for that under an icecap! Some pulsibg signals emerging again at NW/W Vatnajokull. Given the intensity, I would agree with Mike that it is around Hamarinn area, since the signsl is stringest at HUS and VON, followed by DYN and Grimsvotn stations, which are less defined, probably because of the Grimsvotn being in the way. 😀 JOK and SKR stations are also picking up this low anplitude pulsing, which is not really evident on the drums, but HUS does look rescaled due to the yesterdays tremor pulse which probably originated in a similar region as todays activity. Its most likely glacier or water activity. When you look at this page, the sub-window in the middle is the one that currently interests the scientist on duty. The stations selected for closer scrutiny are the ones around Katla. A closer look at Slysaalda SIL (which lies north of Katla and slap bang in the middle between it and Torfájökull) reveals that the sensitivity jumped up several notches five days ago. Presumably, and I am guessing here, it was intentionally in order to monitor possible hlaups from Katla, but it could also be the result of an instrument malfunction. It is an electrical malfunction at Slysaalda station. The signal is corrupted. It was also found at a Chippendale’s Show last week. After looking at it is probably meltwater discharge. It has a daily cycle. Ahem… I am the idiot who coined the “popcorn” term. It’s what came to mind looking at a collection of events on Redoubts drum plot. My apologies. They are similar to classic tornillos but have really short durations by comparison. Meanwhile, an old plot of mine that helps visualize what Carl’s magma blob trip looks like. Remember, that you are seeing a really wide view angle looking at the whole island system. Very exciting! Perfect illustration to Carls post. Please, more of your exciting plots in the future! First time I read that name (untold eons ago) I thought it said Spittoon on the Furnace. Still to this day I have to concentrate to remember the correct name. It is one of the nicer volcanoes of the world. Nothing to write home about… except that it’s a pair – and at interesting depths; I don’t recall seeing too many at the depth in Hekla. Not common with pairs at that depth at Hekla. But I can’t see any other earthquakes there so it seems that there will not be an eruption in the next couple of hours. That being said, Hekla has never been as noisy as this summer in intrumental history. After going through all available instruments several days back I can’t find a single thing pointing towards an upcoming eruption at Hekla except those two earthquakes. Nor has there been any signal indicating one after the earthquakes. It seems that Hekla has developed a sense of humor and changed its pattern a wee bit and that is now normal for Hekla to suffer from earthquakes on at least a weekly basis. As Hekla gives no warning, the fact that nothing is pointing at an eruption must mean one is imminent.. There was another M2 on Mauna Loa though off the rift. The uplift since Aug 1 has been 10 cm. The M4 and M2 may be caused by this uplift? My feeling is that the likely period for a Mauna Loa eruption is between 5 months and 2 years from now. Of course these kind of predictions are better made in hindsight! Carl, that was a very nice explanation for the pre-eruption process! Usually Hekla earthquakes are small and about up to M1.5. I reckon that Hekla could have had many earthquakes up to M1.5 in between eruptions prior to 1947 eruption, because those earthquakes would never be felt by locals. We assume Hekla is asseismic in between eruptions but perhaps this has only been occuring since 1947 as Hekla has been very active since then, and there has been no need for earthquakes as magma conduits remained fresh. But perhaps now magma is trying to push into new directions, hence the small earthquakes. I assume that much should have changed in Hekla conduits after the large quakes of 2000 and 2008 in SISZ, as the microplate moved. You also had a large earthquake at Vatnafjöll in 1987 that was magmatic in origin. As such it is one of the largest VT type earthquakes recorded in Iceland. That earthquake in combination with the two you cited have probably shifted things sufficiently to change the paradigm a bit, but not enough to entirely change everything. I still think that the post 1947 model is valid with just a small bit of permutation. 2.9 and a 3.0 at the same time just south east of Kilauea. The level of the lava lake is still very high. Another really shallow swarm at Katla today. 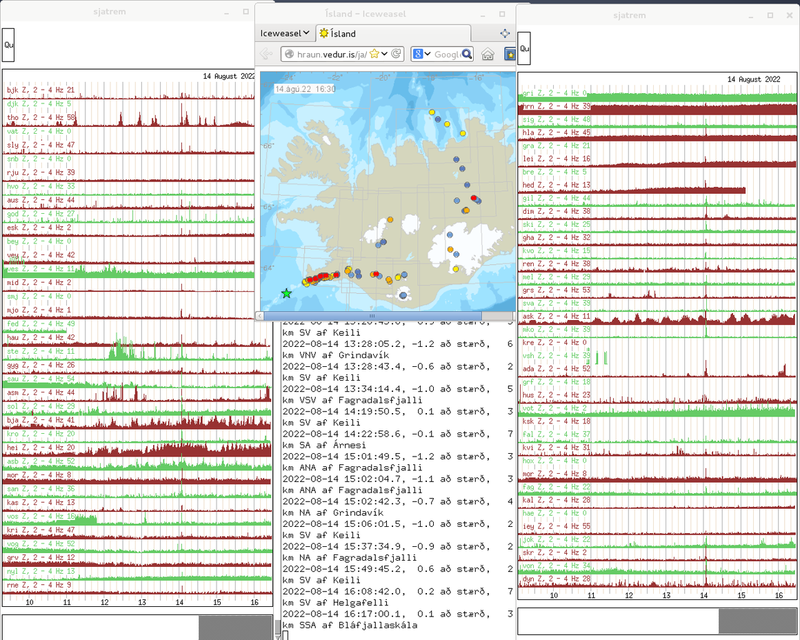 Two quakes around M3 at surface level in Katla caldera. Water/steam explsions? New “daily” star at Katla. Daily since there is almost one per day now. Or not. 😀 Kinda like Bardarbunga. Tho to be honest, “pre-eruptive” (not that Katla will erupt tomorrow,but I classify everything following up to the eruption being pre-eruptive, even if eruption is 10 years away. Mainly meaning pre-eruptive as in a system able to erupt in a near future) daily stars at Katla are much more interesting to follow than the post-eruptive ones. I agree both on the usage of the term pre-eruptive and the lack of interest in the post-eruptive earthquakes. OK! back from Camping trip and nothing has erupted…This means they are not ready yet as Sod’s Law (Murphey’s law) states that if I am away something will erupt. Katla is waiting to be as much as diva as she can be and she will do it BIG style! Mauna Loa is biding her time also to make a grand entrance and hekla just is myysterious and keeping us on our toes!. I am happy to hear that you guys had a fabulous trip and a nice coming home Diana! And a bit of a late night conundrum. This is the Fedgar station that is placed at the northern end of Hekla. 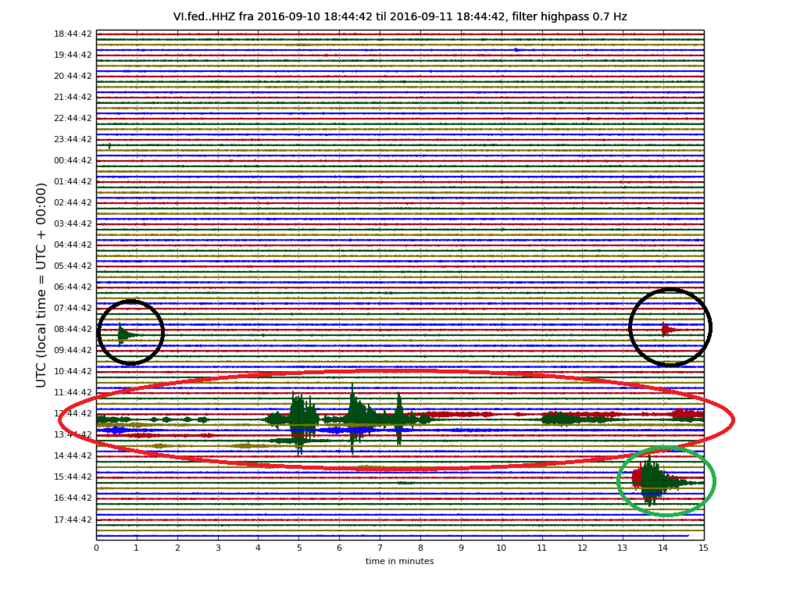 The pattern on it is only visible on that seismometer and not on Mjoaskerd. If it had been at any other volcano I would have guessed that it was a local small hydrothermal event, but at Hekla that seems implausible. So here is the evenings happy “guess what Hekla is doing”. 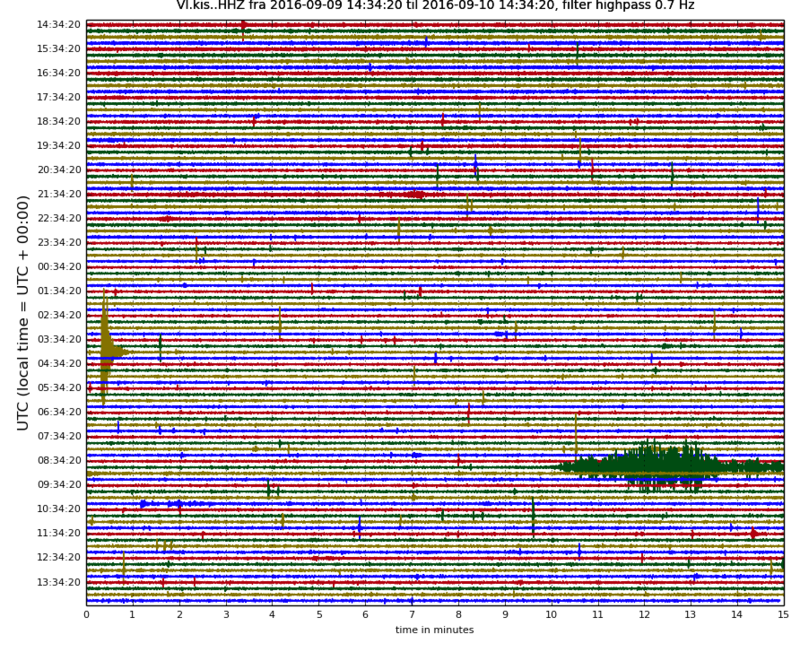 Black is the earlier two earthquakes at Hekla. Red is the part that is very odd. And the green is the Katla hubbub. Thank you Carl…. As you always stress “Look at the trend of the data not individual events. I think the trend of seismicity appears to be rising? Especially if you are only counting those earthquakes that are situated under Heklugja (the actual fissure) and discard those further out. If you do that the trend is clearer because there have always been distal earthquakes. How far is the nearest geyser? Is Katla winding up or? Shallow activity only so far.. I really need to vomit now after all these years, be patient. I’m not mad, but this can still be ugly for you. 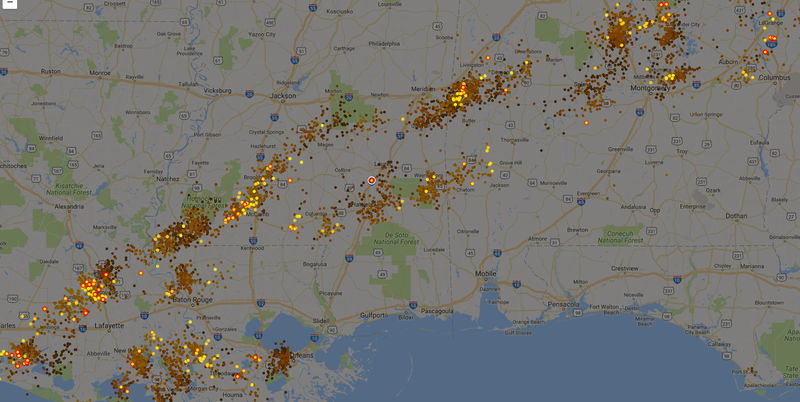 This is a snag of the one hour lightning strike map for the area. There are storms throughout the area. That is essentially “winter” trying to move into the area… though it is taking its dear sweet time about it. Does this mean that deciduous trees attract lightning more than Conifers/Pines/ or does it mean that if they are struck they are damaged less? How very interesting. Thanks Lurking. It means that the competition is to see who can keep the static charge from building up the fastest. It’s like the old “How do you out run a bear?” Adage. You don’t have to be faster than the bear, just faster than the guy next to you. Whoever looses the race, is gonna take severe damage. I’ve seen lighting strike damage that make the tree literally explode. I’ve also seen cases where the lightning stripped the bark off in a strip denoting the path down to the ground once the circuit completed. (The step-leader connected) If you dig around on the Net, you can find photos of step leaders from all sorts of objects. These are forming ion channels that make their way towards the opposite accumulated charge. When the leaders connect, the charge dumps, and you get lightning. As for the attracts more lightning bit, I don’t think that’s true. It’s just that the normal physiology of a pine make it less likely to accumulate a charge due to the shape of it’s leaves. That gives it a survivability advantage. In a large stand of trees, somebody is gonna get hit, it’s just a matter of not being that tree. One thing that is pretty unique around here, is the prevalence of red clay soils. Whenever a new roadway is being build or worked on, one of the base soils they use is red clay. When not saturated, it distributes loads very well and is quite stable. Clay pits aka “Borrow Pits” are not uncommon. After they are used, they tend to become land fills. This is the reason that the local “Wedgewood” neighborhood has H2S warning signs at it’s entrances and that the residents are up in arms against the illegal dumps in the area. Regulations prohibit the dumping of household garbage and only allow construction debris. This lake 30°29’56.21″N 87°16’28.85″W is in one ex borrow pit next to that neighborhood. It’s down near the local UPS office. I’m not sure, but I think this one was used during construction of the Interstate through here. Caveate on the trees. It’s not 100% pine, but pine dominates the region. Various Oaks and other deciduous trees are quite prevalent. Just east of Gulf Breeze, along US 98, is the US Live Oaks reservation. Those trees were specifically set aside by the Federal Government for ship construction. When Ivan tore through here and damaged a lot of the trees there, people were clamoring for a chance to get in there and “clean up the mess”. (Oak commands a premium price in the firewood market) The US government, in a rare stroke of intelligence would have no part of it. They sent a crew in to salvage optimal cuts for storage in the event repairs were ever needed to the USS Constitution. They even sent a shipwright to supervise the harvest. Ya see, ships of that era used specific cuts of the tree for certain parts. These cuts were picked to make support structures (beams and spars) that matched what the wood’s load bearing purpose was when it was part of the tree. One of the reasons that ships of that era were phenomenally tough and resilient. Personally, I’m glad they did this rather than just turn the harvesting over to who paid the most to some politician. Oh lookie. Not only does the Pekinese go bat @#$@ crazy from thunder, he does the same for the weather alert tones on the TV. The gust front from those storms in the image rolled through here and pushed up a few more local storms, the weather office in Mobile puts out an alert about it, now the Pekinese is glued to the ceiling. Hekla is very young compared to Mauna Loa, about 7000 years old. Looks like another water (hydrothermal) phase is ongoing around Hamarinn area, likely around Skafta cauldrons. This is the peak time for glacial melt, so the normal assumptions is that anything out of the ordinary at this time of the year is melt related. Water on a volcano is like putting oil on a fire. Volcanoes: the ORIGINAL Greek Fire. To those who invoked my name…. I am still here, lurking on the shadows. I warned you about a large eruption and as I am not a politician, I deliver what I have promised. You have just seen the first of a series of large events to take place in Icedland during the next 20 years. That was Holuhraun. As I am a volcano, I am very aware of all my sister´s preparations. The next large eruption in Iceland comes in July 2018. On the 13th. Guess who? I am not going to spoil the surprise for you. Askja, Katla, Lambafell and Öræfajökull. Askja told me she doesn´t mind of disclosing her secrets. So actually, her eruption will be a lava fissure outside of her caldera, to the northeast direction. At the moment, there is plenty of cracks waiting to be filled with magma, but the 2010 magmatic pulse from within my depths has not yet reach her. It will in a few years. But – who cares about the Icelandic eruptions in the next decades. More interesting are the next caldera events in Icedland, which will be rather impressive. Far greater than let´s say sis Pinatubo. And who´s next going caldera? Ahhh, you know it, it´s our young lady Hekla! and that is not so far away in the geological time. The other caldera forming event, further in the future, will be of my fatty sweet sister Öræfajökull. But by then, you will not be here as you know it. Anyways, don´t bother with this too much. You tiny humans will have much more to concern with in the next few years. Uprisings. You have all the answers within yourselves. Your heart holds the key to your challenges. Where our volcanic consciousness is located, neither future nor past is away from the present moment. So we grasp our pulsating nature as different melt and remelt locations of eternity. Show must goes on!!! “You’re a floozy Madame Bárðar, but I love your low down ways” (to misquote the Global Village Trucking Company). You’re all quake and no action. The problem is your heart, its cold and dead but deep down in your bowels, things are moving but you have leaks, big ones. Those leaky bowels of yours are being fed from the South East but everything is squirting out towards Big Mr G and Cousin Ham. Mr G you set off a few years ago but Cousin Ham is getting charged and ready to blow. So move over, there are new kids in town and your days are done. July 13, 2018 is a bit precise. Do volcanoes use the same calendar as us mere mortals? Partial solar eclipse visible only south of Australia. Don’t see the link to Bardarbunga. The final part of the Pluto trilogy is out. A decade in the making.